Mission: Franklin County Chamber of Commerce is a membership organization dedicated to strengthening and sustaining economic and civic vitality in our region. Incorporated in 1919, the Chamber is a private organization funded primarily by annual investments made by member businesses. A volunteer board of directors governs the Chamber, an organization of business leaders who work to improve their community and the area’s business climate. 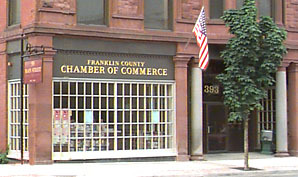 The Chamber office, in downtown Greenfield, serves as a central location for brochures, maps, guides, and information about local points of interest and commercial resources in Franklin County. In our role as one of thirteen Regional Tourism Councils, we have a close affiliation with the Massachusetts Office of Travel and Tourism. Business counseling is provided, free-of-charge, in our offices, by the Small Business Development Center and SCORE, the Service Corps of Retired Executives. The Chamber operates the Visitor Center in Greenfield, which shares space on Miner Street at the crossroads of I-91 and Route 2 with the Greenfield Registry of Motor Vehicles branch. It is a prime venue for display advertising and brochure placement, as close to 150,000 travelers pass through the Center annually. Many are being lured to "stay and play" by the high visibility given to area attractions and the efforts of our excellent staff, coordinated by manager Peg Saulnier. The Greenfield Business Association (GBA) is housed in the Chamber offices. Visit the GBA website here. We are not affiliated with the U.S. Chamber of Commerce. The Board of Directors of the Franklin County Chamber of Commerce congratulates our Executive Director, Natalie Blais, for her victory in the Democratic primary for state representative of the First Franklin District. We know that Natalie will serve her district and Franklin County with dedication, enthusiasm and skill. For us, it is time to find a new Executive Director. To learn about the position, click here.